The Ice Cream Dream is a family run ice cream bicycle hire business located in Conwy along the beautiful North Wales coast. 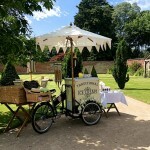 Using Pashley classic, vintage 1940’s ice cream tricycles our aim is to provide you and your guests with a truly unforgettable experience. Our trikes are environmentally friendly with freezers running on a 12 volt battery that can last up to 12 hours. Therefore they require no electricity, allowing us to serve you wherever you choose inside or out all year round. 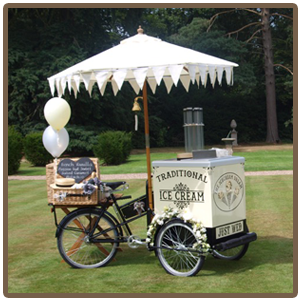 Serving you with the most delicious, cool and creamy luxury Welsh made dairy ice creams and real fruit sorbets – A perfect addition to weddings, garden parties, corporate events, birthday parties and many more. We take great pride and pleasure in providing an unrivalled service. Our love of ice cream has led us to fulfill our ambitions. Life holds special magic for those who dare to dream… The Ice Cream Dream!